Zimbabwe’s new foreign affairs minister says that the southern African nation will not allow the West to dictate its policies and that no country had a monopoly on how diplomacy should be conducted. In a hurriedly called address to diplomats accredited in Zimbabwe, new Foreign Minister Sibusiso Moyo said there are “no angels” that should dictate any country’s foreign policy. The address was delivered after Zimbabwe’s opposition and civic leaders testified Tuesday before the U.S. Congress and asked the international community to push Harare to ensure free and fair elections. Moyo said President Emmerson Mnangagwa’s government, which came to power last month with the backing of the army, had started reaching out to Western countries like the United States and Britain to normalize relations strained under former president Robert Mugabe’s administration. “We seek therefore an honest, respectful and forthright dialogue that lets go [of] the past and explores and pursues mutual beneficial economic opportunities. We must respect one another and, of course, we are not going to be lecturing anyone, nor do we expect the vice versa. Our rapprochement will thus be characterized by new vibrant trade and economic relations,” Moyo said. The former general said Zimbabwe would respect all trade agreements the previous administration had reneged on. 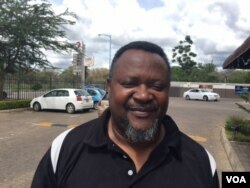 He said he looked forward to countries like Brazil, China, Russia and India to continue assisting Zimbabwe as it negotiates with the West, which imposed sanctions on some ruling Zanu PF officials in 2002, following reports of election rigging and human rights abuses. But the director of the International Commission of Jurists in Africa, Arnold Tsunga, says a lot has to be done for that to happen. Members of the International Commission of Jurists have been in Zimbabwe assessing the human rights situation in the country.